Large timber playground canopy constructed for Brannel School. As part of a brand new school development, we designed and built a large timber canopy for Brannel School covering 109m². 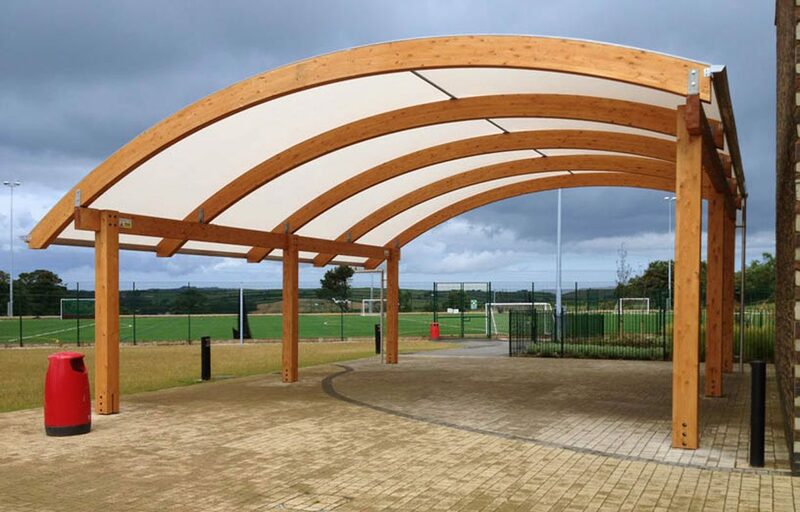 This playground canopy enhances the external environment and allows students to be outside whatever the weather. A stained light oak timber finish complements the surrounding area. The structural timber canopy is completed by an Opal 60 roof covering. This solution has been developed exclusively for Fordingbridge and is an ideal roofing solution where higher light levels are required as well as shelter from all weathers. Roof: Fire retardant Opal 60 fabric, this fabric allows high light penetration while providing complete UV protection. Our tapered trellis structures can also be covered with hard wearing translucent 16mm triple walled polycarbonate.